Posted on March 20, 2010	by Lou Murray, Ph.D.
What glorious weather we’re having, sunny skies and temps in the high 70s. Spring is busting out all over. I had a work day this week, so I thought I’d share some photos of this month’s Orange County Conservation Corps new hires. 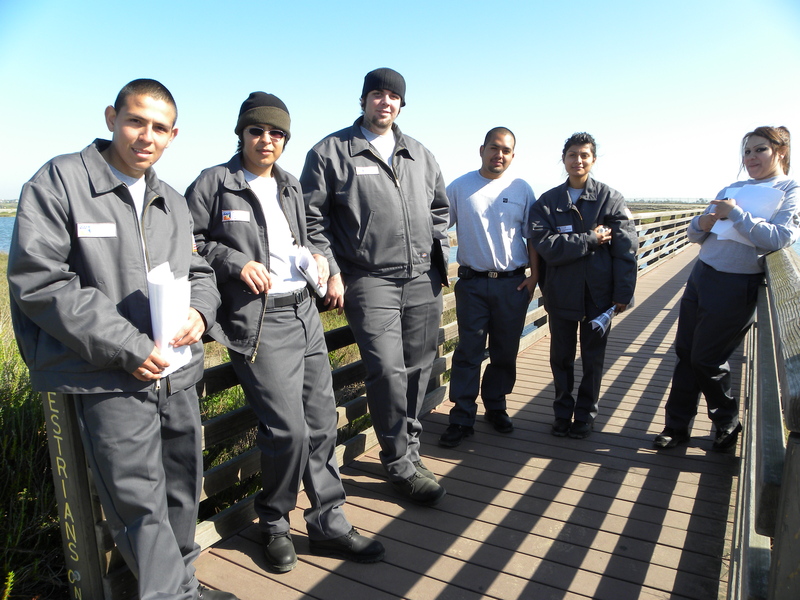 For our educational day in the field, we did a wildlife survey at the Bolsa Chica Ecological Reserve. I give each Corps member a checklist. They also have photo sheets of the various kinds of wildlife from invertebrates to mammals that we’re likely to see. We found round stingrays on this survey, the first of the spring. Seal Beach and the Bolsa Chica have the largest concentration of round stingrays that is known. But we saw no sharks. Although gray smoothhound and leopard sharks are present in abundance in the summer, they’re usually not visible from shore. What do you think they're photographing with their cell phones? Wildflowers? Not a chance. March is when the rattlesnakes come out of hibernation. We survey the rock pile where they den every time we go, but only see the snakes in March. Can you see the head? Lower right corner. This snake is large, but not full. Looks like it hasn't eaten all winter. As soon as it warms up, it will go looking for a baby ground squirrel for lunch. 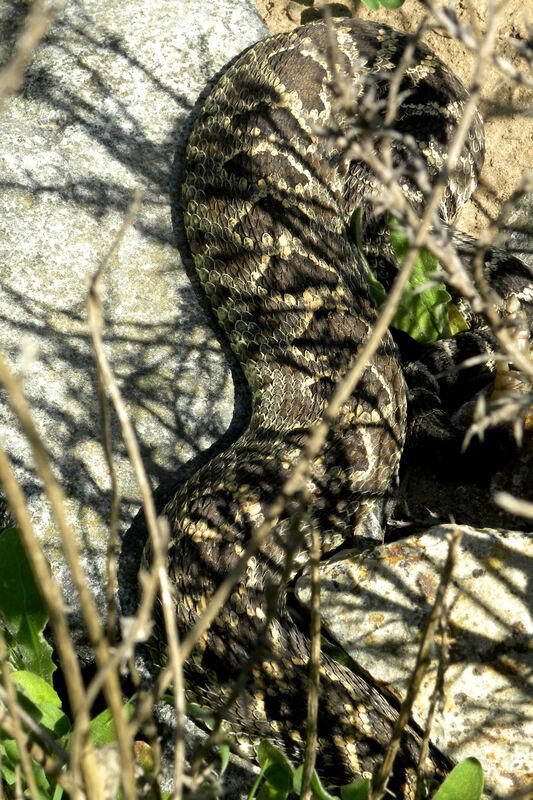 The Western Pacific rattlesnake was a rare find. 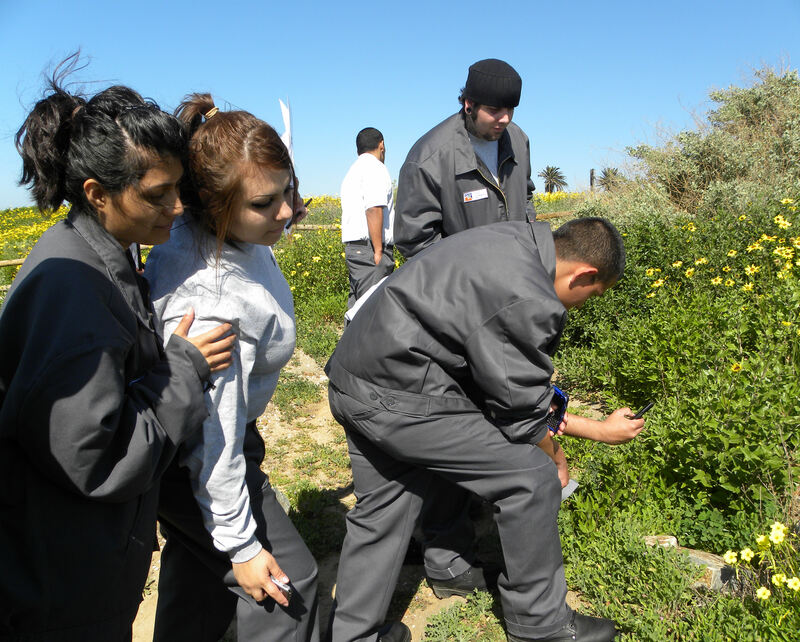 After our field trip, we go to the Bolsa Chica Conservancy Interpretive Center to look at the marine aquarium and touch tank, as well as live non-poisonous snakes such as gopher and king snakes. Fun day. Yep, this is what I do for a living, such as it is. I’m only working about one day every other month, so I’m pretty much retired these days except for my newspaper column. 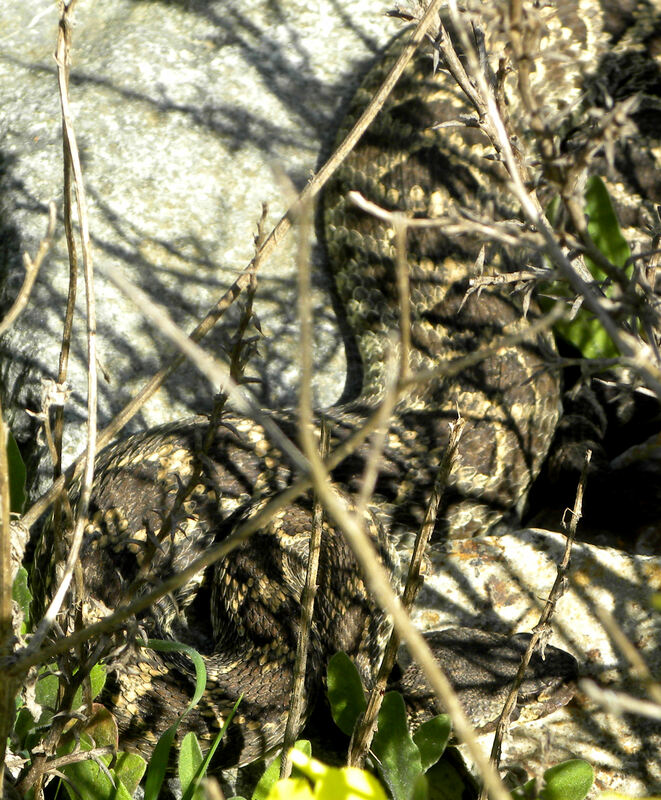 This entry was posted in Uncategorized and tagged Bolsa Chica Conservancy, Bolsa Chica Ecological Reserve, Orange County Conservation Corps, Western Pacific rattlesnake. Bookmark the permalink. My job is a LOT of fun. I can’t beleive I get paid to do something that I enjoy so much. I love exciting these inner city kids about nature, and for boys in their late teens, sharks, stingrays and rattlesnakes do it. I bet stingrays, sharks and rattlesnakes significantly ups the cool factor of conservation work. In Maine I don’t get a lot of oohs and aahs when I point out toads, frogs and garter snakes! Hi Ali. Yep, indeed. We rarely see the sharks, but when we do it’s pretty exciting. They’re between 4-6 ft long and the corps members get really excited by them. The hairs on the back of my neck just stood up….I am a big baby when it comes to snakes. Luckily, we don’t see many around our parts. That seems like a really nice job. Hi Turling, Yes it’s good to be cautious around rattlesnakes. They don’t want to strike us (waste of good venom), but they will if we step on them or threaten them.